Following the latest International Panel on Climate Change report came the predictable, tired lists of how individuals can help avert the catastrophic effects of exceeding the Paris Agreement’s 1.5°C warming target. Given the form and scale of transformation needed, suggesting personal lifestyle changes as the means to significantly combat climate change is at best naïvely optimistic and at worst intentionally detrimental to addressing the enormity of the challenge. The IPCC report indicates that global temperatures currently stand 1°C above pre-industrial levels and at the current pace will reach the 1.5°C target between 2030 and 2052. Gone are the days of discussing the type of planet we want to leave our grandchildren, we now determine the world we want to live in a decade from now. Surpassing 1.5°C means dramatic changes to ecosystems, biodiversity, weather patterns, and sea level - processes that have already begun. The magnitude of change necessary to halt global warming in the next decade demands nothing short of a revolution in how countries consume resources, especially the United States. 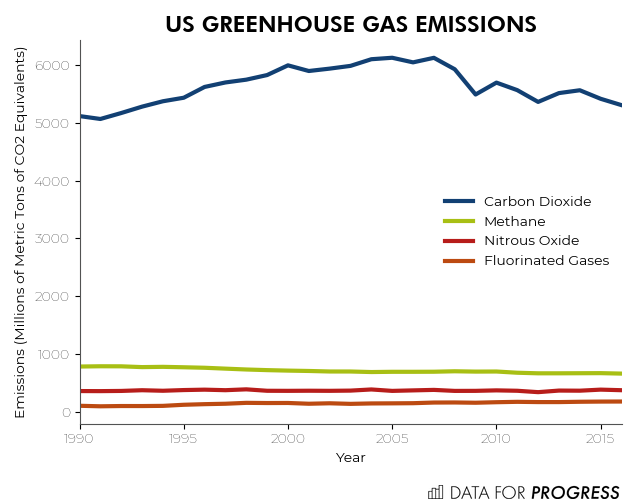 The US finds itself at or near the top of any list calculating contributions to global greenhouse gas emissions: cumulative, current, per capita, or consumption-based. The suggestion that the US tops these lists as a result of individual failures to make sustainable choices reveals a willful ignorance of the policies and power interests pushing carbon-intensive lifestyles. Focusing on the role of individual choices distracts from the true potential for change, which lies in policies that allow for, incentivize, or require lower-carbon behaviors. Presently in the United States, a large proportion of CO2 emissions comes from electricity production and transportation. Lists of ways to fight climate change miss the critical fact that individuals cannot, on their own, build wind turbines, close coal power plants, protect carbon-absorbing forests, or expand subway systems. These actions require government policy and investment. Take, for example, the differential levels of car usage in the US and Europe: do Europeans make fewer car trips than Americans due to a moral superiority when it comes to environmental choices? Possibly. Though likely the cost of gas at over $6 per gallon coupled with the ubiquity of public transit, pedestrian, and bicycle infrastructure throughout much of Europe plays a more sizable role. Compare that to the US where gas is under $3 per gallon in most states and extensive public transit is found in only a handful of major cities, and it becomes harder to demonize individual choices. I have lived in three cities in the past 5 years: in Atlanta I drove a car, in New York City I took the subway, and in Vienna I ride a bicycle. I have been the same earth-loving climate scientist throughout, but the infrastructure around me changed in ways that allowed for and encouraged a less carbon-intensive lifestyle. Indeed, periods when the US has decreased emissions followed changes at levels higher than individual resolve. In 2007, emissions began decreasing steadily for the first time in decades as natural gas, wind, and solar replaced higher-emission coal power production, and the economic recession decreased air travel and industrial production. The sizable decreases in emissions happened when the structure changed not because of a widespread increase in individual concern for greenhouse gas emissions. This is not to say that our choices do not matter. By all means, reduce your footprint as much as possible. But if that is all that changes, it will not be enough. The suggestion that changing your diet or commute could stall climate change is akin to recommending people be nice to their neighbors as a means to end racial inequality. One should certainly be nice to their neighbors, but we cannot expect those individual behaviors to fix a system of institutionalized racism. The same applies to addressing climate change. One can only change behaviors within the confines of a limited set of choices, and those personal behavior changes will not transform the system. Individuals in the US cannot, given the current options and constraints, make substantial enough changes in the timeframe available to us. Any chance we have at addressing US emissions must come from policies that change the system, providing and incentivizing lower-emission consumption options. Take the example of lead toxicity, particularly the effects of leaded gasoline used in the US from the 1920s until phase outs began in the 1970s. The negative health consequences of lead were known, with reports of worker deaths in manufacturing the lead compound on the front page of the NY Times in 1924. Studies of the long-term consequences of low-level exposure were conducted throughout the 20th century, further confirming the hazards of lead particulate matter. Individual behaviors, however, could not limit the amount of lead in gasoline, and voluntary standards for the oil industry did little to require or incentivize reductions. It was not until the 1970s when the newly-founded EPA required large reductions in the amount of lead in gasoline that the population’s lead exposure began to drop quickly and significantly. As in the case of lead regulation, the focus in mitigating climate change should be less on changing individuals’ behavior and more on forcing government action. The good news is: plans already exist for how the US can, at the policy level, decrease emissions in the short-term required, and organizations are already working to force the government to enact such policies. As part of the Paris Agreement, countries outlined their intended nationally determined contributions. The US contributions included plans to reduce emissions from power plants, vehicles, buildings, and landfills. The Clean Power Plan in particular aimed to cut emissions from power generation. The current administration, however, has indicated its intentions to exit the Paris Agreement and repeal the Clean Power Plan. Preserving the Clean Power Plan and remaining a member in the Paris Agreement would certainly be a victory for climate change mitigation, but the severity and immediacy of change demand that we enact broader, more comprehensive programs as soon as possible. We need a comprehensive set of environmental policies, often described as a "Green New Deal", which addresses energy production, fuel efficiency, green employment, air and water regulations, and many other critical components in reducing our national emissions. These types of transformative policies have support among the electorate, support that must quickly translate into legislative action. Although tempting to write off the capacity to make changes under the current administration, waiting until the 2020 election to cut emissions eats nearly 20 percent of the window until we may pass 1.5°C warming. In the midterms, electing representatives, senators, and governors who are responsive to their constituents’ demands for emissions reductions and green job creation will set the stage for transformative state and federal environmental policies. However, simply voting for progressive politicians will not translate into environmental action without continued pressure on elected officials. In the wake of the election, channel your time into organizations continuing their fight to make changes from the city and state-level to regional and federal policy. Rather than devoting energy and resources to purchasing “green” products, we should be supporting organizations in our communities, which are fighting for change at the level that has real impact. Because the effects of storms, air quality, and resource scarcity are felt most immediately by Indigenous, minority, and low-income communities, these groups have led the way in organizing to protect the environment. The organizations are numerous, from the nationwide Indigenous Environmental Network to the Deep South Center for Environmental Justice in the Gulf Coast region to WE ACT and WE DO in New York City, and many others around the country. To address climate change, reach out to such organizations to find ways to support their initiatives. At the end of the day, climate change consequences will affect people along existing lines of inequality. If you care about racial injustice, you must prioritize climate policy; if you care about income inequality, indigenous rights, health disparities, or women’s rights, then climate politics must find a central role in your politics and activism. The stakes are too high to allow ourselves to be distracted. If you’re not going to line up behind the women and men fighting for radical political change, then you can throw away your tote bags and paper straws. Alison Heslin (@alisonheslin) is a postdoctoral research fellow at the International Institute for Applied Systems Analysis.